So I was reading an interview with John C Reilly who was talking about Terrence Malick, and the way he talked about his filmmaking techniques it made me realize that the farm was actually the main character of the movie and made me want to watch it again. Ebert's review made it sound like the film was specifically shot from the younger sister's perspective, but apparently Malick added her voice-over later because he liked her voice, not because he intended the film to be from her perspective. At any rate, it is beautifully shot and was well worth the 90 minutes I spent watching it. This is a truly magnificent film. Long after I saw it, I ended up with a film school professor whose first job out of high school was as a PA on this movie. As he described it, his job was mostly caring for the grasshoppers to be used in the "plague of locusts" sequence, and hiding the keys to the production's cars at night to keep Richard Gere from taking one and heading into town. Although he does appear (sort of) briefly in the film, since one of the female performers in the flying circus troupe refused to go up in the biplane. So in the flyover shot as they're arriving at the farm, she was replaced by my friend in a wig and a dress. Every shot a painting brought to life. Ridley Scott did the same kinda thing with The Duellists. But then he went another way. Saw a 35mm print of it a few years ago at EbertFest presented by the late Haskell Wexler who had taken over when Almendros got too blind to do the work. Amazing movie, probably Malick's best. Wexler took over for the last three weeks of shooting due to Almendros’ commitment to François Truffaut for The Man Who Loved Women, not his eyesight! Wexler worked on the film for 19 days. Almendros gave his Oscar to Scotty Bowers. Days of Heaven is a beautiful move to watch, but at times that beauty also points to some of the difficulties some have with Malick. Take this shot, for example. It looks amazing, but when you start to think about why people would be spread out that way to "listen" to a preacher, it doesn't make much sense. The beauty of the shot supersedes the reality of it in a manner that points to some of Malick's recurring interests but perhaps doesn't put them in the best, um, light. His interest in the metaphysical elements of how he views life, can make the human elements seem almost perfunctory at times. The way he captures "beauty" as evidence of something greater also threatens to run towards cliche around the nature of that "something", where sunlight streaming through the branches of a tree or shots at "magic hour" substitute themselves as emotional evidence when human existence and nature is more than that. It feels good, inspiring even, to see something beautiful and there certainly is a place for that in movies, but it needs to be tied to something, someone's perspective, where the subjective state is given sense, or it can become a dodge, a claim of something more that isn't able to be supported otherwise and which one could hold as weak for knowledge of the opposing possibilities. Without the "ugly", the mundane, or the approachable, beauty as metaphor can feel a bit empty or manipulative. 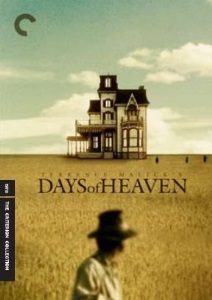 Days of Heaven has much to recommend it as Malick is still exploring the beginnings of what he would delve into more deeply later, but it does give hint to some of Malick's abiding interests and some of those are a bit more difficult to accept than might be suggested by the surface alone. In Malick's films people often seem to float through life, decisions lacking weight for being small in the face of his ideal shown as beauty. That's fine for a film to address, but it needs noting for how it places human decisions and their consequence as something airy in face of the eternal or some such. Malick finds human action as almost something rote, subject to forces beyond our understanding so stripped of important purpose or significance beyond recognition of our smallness. In his early films, Badlands and Pocket Money, which he wrote but didn't direct, there is maintained a sense of human absurdity, where our actions still "count" but are directed by impulses we don't fully comprehend. With Days of Heaven he starts to move towards more "mythic" themes, here recounting something like part of the story of Abraham and in Tree of Life he accepts something of a Freudian familial relationship as determining action, leaving accountability as secondary save for acceptance of our weakness. In all his movies beauty creates the standard of measure for humanity, the existence of the land and light itself serves to show how little we are, only finding meaning in moments where we recognize our place. While that is, in a sense, a powerful image of humanity seen from something like the position of the eternal, it is also dependent on artifice to achieve as in the shot linked and so, so many more in his films. It requires showing life as pure, almost an abstraction which places suffering and wrong on equal footing with any other action, weightless and just another sight to view through the lens of beautiful construction. The metaphysics of that attitude can benefit by being matched to life less serene, to sights less composed for their beauty. None of that means Malick is "wrong" for his approach, that his values aren't worth engaging, or his movies aren't "good", just that what is ignored or slighted need be given attention too in thinking about his films lest those visions of beauty blind one to all else.